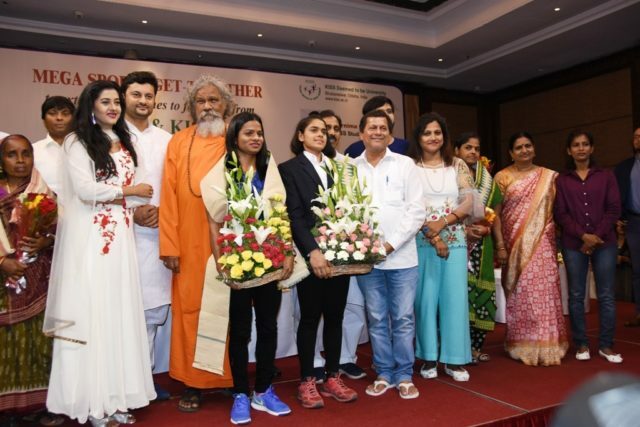 Bhubaneswar: It is an incredible contribution of KIIT Deemed to be University and KISS Deemed to be University to sports, to produce 5,000 sports talents including national and international sportspersons, said Dr. Achyuta Samanta, Founder, KIIT & KISS. A Mega Sports Get-together was organised by KIIT and KISS on August 12, 2018 to extend best wishes to four KIIT & KISS students selected to participate in the upcoming Asian Games 2018. On the occasion, Dr. Samanta said, four girls Dutee Chand, Jauna Murmu, Purnima Hembram and Rutuparna Panda from KIIT & KISS have qualified for the Asian Games. Dutee, who earlier had the distinction of representing the country at Rio Olympics, has qualified for 100m and 200m events. Jauna and Purnima have qualified for 400m hurdles and Heptathlon respectively, while Rutuparna will be a part of Indian Team Badminton Squad. KIIT and KISS are like two sides of the same coin, have been according a high importance to sports and games, besides quality education, since their inception. “Our students have been bringing glory for the country in the field of sports for the last 10 years. They have been representing India and Odisha regularly at international and national level sports meets, including Olympics, Asian and Commonwealth Games”, he stated. Incredibly, KIIT & KISS have about 5000 active sportspersons, 70% among them girls. Over 70 students are international sportspersons and have participated in one or more international sports meets in 14 disciplines. Over 800 students have played in national level meets in 26 disciplines. About 4000 students have participated in state level sports meets or national university/school games. KIIT & KISS have created world-class sports infrastructure to nurture and support a strong sporting culture among the students. There are 15 international standard sports complexes with gyms, swimming pools, synthetic volleyball, basketball and tennis courts, besides indoor badminton, billiards, table tennis, yoga and squash courts. It regularly hosts national level tournaments on its cricket stadium (BCCI approved), Hockey stadium (Global category certification by FIH) and International Archery Stadium. Football Stadium, Olympic size Swimming Pool, International Chess Hall and Synthetic Athletic Track (400m) are among other facilities available on the campuses. On the others P. K. Patasani, MP; Anubhab Mohanty, MP; Dilip Tirkey, EX MP; Priyadarshi Mishra; Ananta Narayan Jena, Mayor, BMC; Ariel Andrade Galindo, Ambassador of the Republic of El Salvador to India; Sergio Darío Arispe Barrientos, Ambassador of Bolivia to India; K. Ravi, President, Odisha Sports Journalists Association; sports personalities including Shradhanjali Samantaray; Anuradha Biswal; Pranati Mishra; Debasis Mohanty; Cine actors including Barsha Priyadarshini and Sabyasachi Mishra were also present and felicitated Dutee Chand and Rutuparna Panda.